The Autonomous Ocean Sampling Network (AOSN) project brings together sophisticated new robotic vehicles with advanced ocean models to improve our ability to observe and predict the ocean. 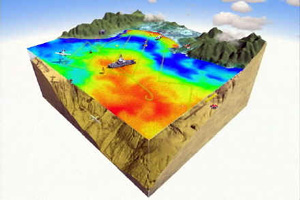 The operational system includes data collection by smart and adaptive platforms and sensors that relay information to a shore in near real-time (hours) where it is assimilated into numerical models, that create four dimensional fields and predict future conditions. Key to our effort is the development of control strategies to command our mobile vehicles to places where their data will be most useful. We call this 'adaptive sampling’. The ability to predict physical properties of the ocean, such as temperature and current, as well as biological (ecosystem productivity) and chemical (nutrient fertilization) counterparts provides a fundamental test of our understanding of ocean processes, as well as an intrinsically useful capability. The success of the AOSN program depends on the collaboration of a network of institutions spread across the United States.